Nagush Khachaturovich Arutyunyan (∗November 10th, 1912 in Yerevan, Russian Empire; †January 18, 1993 in Moscow, Russian Federation) was a scientist in the field of Elasticity, Creep Theory and Mechanics of Growing Solids. His scientific interests covered various branches of Mechanics. He developed original theory of creep of inhomogeneous ageing solids and created a new scientific direction: the mathematical theory of growing solids. Nagush Khachaturovich Arutyunyan was born in 1912 in Yerevan. For many years he lived with his grandfather – the famous historian Leo, whose huge scientific figure inspired respect for study and science, cultivated diligence in the young man. In 1930 N. Kh. Arutyunyan entered one of the most reputable universities of the country – the Kuibyshev Military-Engineering Academy (Moscow). After graduation in 1936 with a degree of engineer and hydrobuilder, he returned to Armenia and started to work in the Sevan-Zangustroy administration as a lead engineer and at the same time taught at the Yerevan Polytechnic Institute. In 1937 N. Kh. Arutyunyan entered the postgraduate school of the Leningrad Polytechnic Institute (at present the Peter the Great St. Petersburg Polytechnic University). Relationship with the famous mechanicians B. G. Galerkin, E. L. Nikolai, and A. I. Lurie played a decisive role in his further scientific life and formed his scientific credo. N. Kh. Arutyunyan always had special love and respect for the Leningrad school of Mechanics, and his scientific contacts with it were never interrupted. After defending the PhD thesis in 1941, N. Kh. Arutyunyan went to the front (Patriotic war). For his military achievements, he was awarded the I and II degree orders of the Patriotic war, Order of the Red Star, and medals. Demobilized from the army in 1945, N. Kh. Arutyunyan returned to Armenia and vigorously resumed his scientific and pedagogical work. In 1949, in Moscow, at the Institute of Mechanics of the USSR Academy of Sciences, he brilliantly defended his doctoral thesis and was awarded the degree of Doctor of Technical Sciences, and in 1950 he was awarded a rank of Professor. In the same year, he was elected a full member and a member of the Presidium of the Academy of Sciences of the Armenian Soviet Socialist Republic. In 1952–1955 he continued his great and productive scientific and organizational work at the Academy of Sciences of Arm. SSR, where he worked as an academic secretary of the Department of Technical Sciences. In 1955 N. Kh. Arutyunyan was appointed head of the newly established laboratory for creep and strength at the Institute of Mathematics and Mechanics of the Academy of Sciences of Arm. SSR. In 1959 he was elected Vice President of the Academy of Sciences of Arm. SSR. In this position, he vigorously worked to strengthen science and research institutions and create new ones. Jointly with the scientific and organizational work, he was engaged in productive scientific and pedagogical activity. In 1945–1951, he had taught at the Yerevan Polytechnic Institute (YPI), and since 1951 – at the Yerevan State University (YSU), where he held the position of Professor at the Department of Theoretical Mechanics. Since 1958 he headed on his initiative the newly established Department of Theory of Elasticity and Plasticity (now the Department of Continuum Mechanics) and managed it until 1978. In 1961 N. Kh. Arutyunyan was appointed the rector of the YSU. The Departments of Biophysics, Nuclear Physics, and Economic Cybernetics and the Joint Computing Center of the Academy of Sciences of Arm. SSR and YSU were founded due to his efforts. In 1962 N. Kh. Arutyunyan was awarded the title of Honored Scientist of the Armenian SSR. For many years he had been a member of the USSR National Committee on Theoretical and Applied Mechanics and its Presidium, an editor-in-chief of the journal “Izvestiya AN Arm. SSR, Mechanics” and a member of editorial board of the journal “Izvestiya AN SSSR, Mekhanika Tvyordogo Tela”. N. Kh. Arutyunyan was actively engaged in social and political activities. He was repeatedly elected the deputy of the Supreme Soviet of the Arm. SSR and the Supreme Soviet of the USSR; in 1962–1975, he was a chairman of the Presidium of the Supreme Soviet of the Arm. SSR and vice-chairman of the Presidium of the Supreme Soviet of the USSR. He suitably represented Armenia and its achievements in various areas of public life in the Soviet Union and abroad. In 1975, N. Kh. Arutyunyan moved to Moscow and joined the Institute for Problems in Mechanics of the USSR Academy of Sciences as the head of the Department of Mechanics of Viscoelastic Solids. During the years of residence in Moscow, his scientific and human ties with Armenia did not weaken. At the same time, he managed the Department of Viscoelasticity of the Institute of Mechanics of the Academy of Sciences of Arm. SSR. N. Kh. Arutyunyan, as one of the skillful organizers of science and higher education in the Armenia, made a large contribution to the formation and training of young scientists and engineers. His brilliant lectures at the YPI and YSU, full of the modern achievements of science in various fields of continuum mechanics, paved the way for future professionals and scientists. He directed the work of numerous young scientists and postgraduate students and created his original scientific school, having received deep respect from numerous students and followers. During his years of work in Moscow, he also had a large number of students and followers from different republics of the Soviet Union. Due to his initiative and recommendations, numerous graduates of the YPI and YSU continued the postgraduate education in the famous scientific centers of the Soviet Union. N. Kh. Arutyunyan was widely known and had a great authority among scientists of the Soviet Union and foreign countries. N. Kh. 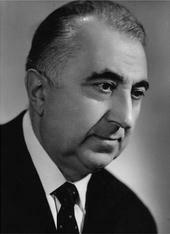 Arutyunyan died on January 18, 1993 in Moscow, remaining devoted to science until the end of his life. He left a great scientific heritage – seven fundamental monographs, about two hundred original scientific works, a scientific school, numerous students, and followers in Armenia, in the CIS countries, and abroad. His scientific ideas and results will undoubtedly serve as the basis for new ideas and creative achievements of young scientists. N. Kh. Arutyunyan developed his science and research activities mainly in two directions: Mathematical Theory of Elasticity and Creep Theory. His first works on the Elasticity are devoted to torsion and bending of prismatic rods with a polygonal cross section, where he offered an effective method for solving these problems by means of additional and orthogonal functions, based on their reduction to the solution of infinite systems of algebraic equations. Later, this method is widely used in numerous researches and during time has become a classic and entered the monographs and textbooks. The scientific results obtained in this direction are summarized in the fundamental book (Arutyunyan and Abramyan, 1963). N. Kh. Arutyunyan carried out an extensive scientific and research work in the field of contact and mixed boundary problems of elasticity and with his students received the exact solutions for certain classes of these problems (Aleksandrov and Arutyunyan, 1984; Arutyunyan et al., 1989; Antipov and Arutyunyan, 1991, 1992, 1993). He also developed the scientific direction of contact problems of transferring the load to elastic massive solids by means of thin-walled elements in the form of stringers. N. Kh. Arutyunyan brought the greatest scientific contribution to one of the most important areas of Mechanics of Solids – the Creep Theory. Having processed and analyzed the results of numerous experiments, N. Kh. Arutyunyan and G. N. Maslov came to the conclusion that in matters of solidity and durability of engineering constructions made, for example, of concrete, plastics, soil, and fiberglass, in addition to the usual physical and mechanical properties of materials, it was also necessary to take into account the properties due to the creep phenomenon, as ageing and heredity. This fundamental idea formed the basis of the, developed by N. Kh. Arutyunyan, new mathematical theory of creep of ageing solids, which later entered the science as the Maslov-Arutyunyan Creep Theory. Taking into account this theory, changes have been made to the existing standards for calculating the strength and durability of numerous building structures and their elements. The primary results of N. Kh. Arutyunyan on the Theory of Creep are summarized in the fundamental monograph (Arutyunyan, 1952), which was one of the first in the Soviet Union and in the world. This book has been for decades and remains a reference book for many generations of scientists and research engineers. It has been translated and published in England (Arutyunyan, 1966), France, and China, and certain chapters, in Germany, Poland, and Romania. In the statements of constructed linear and nonlinear creep theories, N. Kh. Arutyunyan studied contact and numerous other problems that had theoretical and practical significance, and he formulated the principle of superposition of generalized displacements in nonlinear problems (Arutyunyan and Kolmanovskii, 1979; Arutyunyan and Zevin, 1982; Arutyunyan and Kolmanovskii, 1983; Arutyunyan and Radayev, 1989). In the last two decades of his scientific work, N. Kh. Arutyunyan essentially generalized and developed his original Theory of Creep, having developed the Creep Theory of inhomogeneous hereditary – ageing solids and created a new scientific direction: the Mathematical Theory of Growing Solids. The obtained scientific results are summarized in numerous monographs (Arutyunyan et al., 1987, 1991) and scientific works (Arutyunyan et al., 1984; Arutyunyan and Naumov, 1984; Arutyunyan et al., 1985, 1986; Arutyunyan and Metlov, 1986; Arutyunyan and Drozdov, 1986b,a, 1988; Arutyunyan et al., 1988; Arutyunyan and Manzhirov, 1989; Arutyunyan and Drozdov, 1989, 1992).